Yours, O Lord, is the greatness and the power and the glory and the victory and the majesty, indeed everything that is in the heavens and the earth; Yours is the dominion, O Lord, and You exalt Yourself as head over all (1 Chronicles 29:11). Did you know that the green of leaves and the red of your blood are exactly the same substance, up to a point? Our Lord Jesus uses many steps to create chlorophyll (the green of leaves) and hemoglobin (the red of your blood). What’s amazing is that the first nine chemical reactions in the formation of both are exactly the same. Which begs the question: How could a plant and a human being have the exact same chemistry since they are such vastly different organisms? The answer is that God is the Creator of all—the same divine mind has fashioned both. 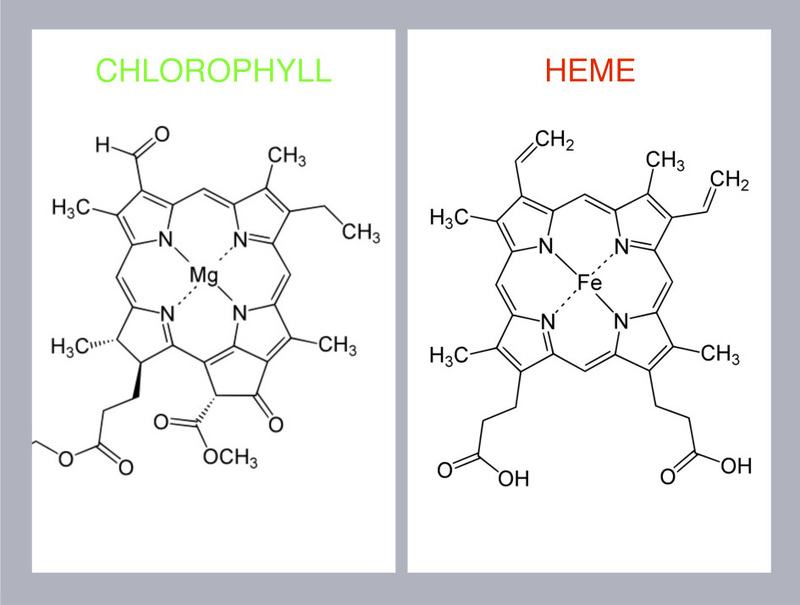 There is a critical step in the formation of both chlorophyll and heme (the building block of hemoglobin) when metal is added—either magnesium (Mg) or iron (Fe). If our Lord Jesus adds a magnesium atom, chlorophyll will be the result; if an iron atom is added, then the molecule eventually becomes hemoglobin. This choice of metal determines the type of work that the subsequent molecule performs. Green chlorophyll, which has at its heart a magnesium atom, captures energy from a star 93 million miles away; red hemoglobin, which has iron at its core,10 captures life-sustaining oxygen from the air and carries it in your blood. Vastly different functions are determined by a single atom of metal. If you are a Christian, the same thing applies to your spiritual life—if God gives you faith, then you believe; if He provides courage, then you are bold; if mercy, then you’re merciful. There is never a need to feel that our gifting is better or worse than someone else’s because it is God alone who determines it. Without chlorophyll and hemoglobin, none of us could survive. I am so thankful for Christ’s application of both magnesium and iron in the chemistry of life! It reveals Him—with His Father and Spirit—to be the God over all (Isaiah 45:22) and the God who cares deeply for us (1 Peter 5:7). The health of ecosystems is dependent upon the green of chlorophyll, and the health of our bodies upon the red hemoglobin in our blood (anyone who has experienced iron deficiency anemia knows this to be true). Much of our culture today is focused on these two things: the health of the world, represented by “green,” and the well being of our bodies, evidenced by the high priority given to health care and hospitals. Jesus also proclaimed that, “He who eats My flesh and drinks My blood has eternal life.” (John 6:54 emphasis added). The Lord promises to create a new Earth for His people (2 Peter 3:7,13). Will this new Earth possess chlorophyll and green plants? Only God knows. But of the two molecules —chlorophyll (green) and hemoglobin (red)—it is significant that the blood of Christ alone can save a person from their sins and the wrath to come. So we might see “green” as an emblem of God’s love and provision for life here on Earth, and “red” representing His gift of eternal life. It is not through the green of chlorophyll that we are saved from the wrath to come, but through the red blood of Jesus, God’s Son. God’s people are not redeemed with perishable things, but “with precious blood, as of a lamb unblemished and spotless, the blood of Christ” (1 Peter 1:19). And they are saved with not just any blood, but the crimson blood of Christ. The first chapter of Peter’s first epistle clearly outlines this contrast. Our bodies, like green grass, will pass away, but the heart that is captured by the Word of God and convinced that the blood of Christ saves will receive eternal life. Caring for God’s creation is extremely important—it was the first job given to mankind by his Creator (Genesis 2:15). But creation must also be redeemed—we can’t simply work to sustain it. And we can’t correct the corruption that our sin has wrought upon all of nature (Romans 8:19-22). The late British pastor, D. Martyn Lloyd-Jones, once said, “Nature every year, as it were, makes an effort to renew itself.” But he also pointed out that ultimately this renewal fails (as the spring creation moves into summer, then autumn, and finally winter), because our sin’s effect upon creation has not yet been removed. But there is hope! God will renew and recreate nature once and for all time (Romans 8:20-21). In fact, the redemption of those things that are green—that is, creation—is also purchased through the red blood of Christ and His blood alone (Colossians 1:20; Isaiah 11:6-9). When will this happen? When all the sons of God are finally revealed (Romans 8:19). I love science because it shows me how Jesus fashioned the universe, and it points my heart to those things that reflect His glory. This display of Christ’s glory is similar to an artist’s personality being seen in his or her paintings. But I love God’s Word even more because it shows me a clear and accurate picture of my sin and my desperate need for a savior. And it shows me the stunning beauty of the redemption Jesus has given me through his blood. Christ Jesus is God over all (Romans 9:5) and there is no other Lord apart from God. He is Lord over the earth, our bodies, and the salvation of His people. The stamp of His lordship can be seen everywhere in Heaven and on Earth (Isaiah 6:3). Glory be to our Triune God—Father, Son, and Holy Spirit!